Decals specifically for the Cockpit series and therefore not all used. On the whole I would the rate the set as 7/10. See the previous review for a history of this aircraft. This kit is a re-boxed Dragon kit and it shows. The detail is crisp and panel lines are recessed with a nice array of different bits within the cockpit to build a passable Komet straight out of the box. There are 4 plastic sprues moulded in light grey plastic, one clear sprue and two photo-etch frames. As this kit has a number of variations there are quite a few spares on the parts sprues, this enabled some to be substituted (or put in where they did not exist) into the Testors kit. It also comes with a boarding ladder and a pilot figure (No, this one is not laughable!) that can be made up in the climbing position. As is the case with quite a few Dragon kits there are some fit problems but judicious use of putty sees most of the problems sorted. The kit has three versions that can be made, however as this kit is from Hasegawa’s Cockpit Series only decals for this version are supplied. The other two versions are both from JG400 Squadron. One is White ‘14’ from 2. /JG400 Squadron and the other is ‘26’ from 1. /JG400 Squadron. Like chalk and cheese this kit’s canopy was full of detail and I simply added Eduard photo etch and thin copper wire to round out round out the “office”. This kit offers photo-etched parts for the armour plate screen that was used in this kit and the Eduard photo-etch parts used in the Testors kit. The seat belts are presented as metal etch in the kit and these were discarded in favour of the Eduard set (brass as opposed to steel ones in the kit making them easier to bend into shape). The cockpit was painted in RLM 66 Schwarz Grau with various knobs and levers being painted red. The seat belts were painted olive green and the instruments dials were represented by film painted white on the back and then overlain by the photo etch painted Schwarz Grau. The dial bezels were painted different colours, depending on their functions. The Fuselage and WingsThis kit has the fuselage as two halves that include a substantial part of the wing root, making the wing attachment a simple affair, although there were a few gaps in the join that required some putty. The cannon openings are present and similar to the Testors kit, I elected to use brass pipe to simulate the MG-151/200 cannon barrels. However, on this kit I elected to make them flush with the leading edge of the wing root. 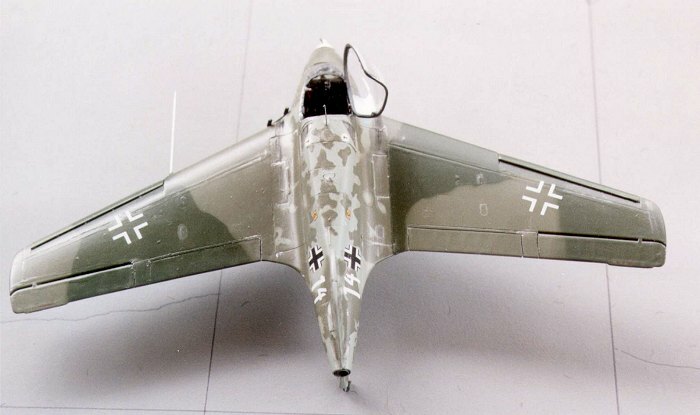 This kit would be built as a Me 163B-1 of JG400. Once the two fuselage halves were connected the completed wing assemblies were attached and the whole thing put to one side to set. The lower portion of the fuselage directly underneath the cockpit is metal etch using the kit offerings and this is painted in Model Master RLM 02 Grun. It is into this cavity that the skid assembly retracts after take off. The dolly, complete with wheels is jettisoned also at take off. The skid assembly is made up of plastic and metal etch and includes three struts that are extended when the aircraft is on the ground and attached to the dolly. I assembled these after I had painted the airframe and in retrospect the assembly should be attached prior to fixing the fuselage halves together as it was difficult to get the three struts into the opening and get them to move – they don’t quite do that as well as they should had I assembled it in the correct order. The top part of the skid has a metal etch piece with lugs that must be bent over to attach to the strut extensions. I chose the tail wheel with no fairing for this kit and this is glued into the rear opening. The tyre was prepainted with Gunze Sangyo Tire Black, as were the tyres on the dolly. The upper portion of the skid, struts and the tail wheel assembly were all painted RLM 02 Grun, with the skid being painted in Gunmetal as for the Testors kit. Both kits received some dry brushing of silver on the base of the skid to represent the scuffing associated with high-speed landings. This was when the airframes had been completely painted. This aircraft needed to be a little different and I had decided that I quite liked the little symbol of the flea screaming through the air with a rocket flare training it’s behind! This crest belonged to the second squadron of JG 400, based at Brandis at the end of 1944. The translation of the motto is: “Like a Flea, But Wow!” I decided that I would attempt to do aircraft No. 14 from this Squadron. The serious problem with this aircraft was the complicated mottled surfaces along the fuselage sides and across the wing roots and tail section of the aircraft. I first sprayed the aircraft undersides, fuselage and tail sections with Model Master enamel RLM 65, Hellblau and put aside to dry. To get around my poor spraying technique and the complexity of the pattern I decided to photocopy the pattern displayed in the Testors kit, which was close enough to 1:48 scale, and then cut out the mottled bits attach the sheet to the aircraft and spray them with the edges slightly away from the surface. The result is a soft edged mottled surface that closely represents the original aircraft’s scheme. For the mottled colour, which also forms the base for the upper wing surfaces, I used Model Master RLM 80, OliveGrun. The final colour sprayed was Model Master RLM 71, Dunkel Grun. The front portion of the aircraft was painted Model Master Scale White with a black ring immediately aft of the white area. The little spinner for the in-flight electrical generator was painted silver. Once all the colours had cured I gave the panel lines a very diluted wash of black and, like PK+QL sprayed the whole airframe with Humbrol Satin Clear after giving the aircraft a somewhat weathered look using silver on panels to show extreme wear and tear.
. The decals for the most part came from the Testors kit. This was more due to the fact that the decals supplied with the Hasegawa kit were for a single model as part of the Cockpit series. The only useful decals from this kit were the various aircraft insignia such as the T-stoff, C-stoff decals, put trestle here (albeit in German! ), etc. The Testors decals are very well printed and quite thin without much register loss. I encountered a small problem with the colour for the T-stoff symbols. There are four such symbols and they are positioned next to the relevant fuel cells. They are supposed to be white circles with a black “T” in the middle. I ended up cutting circles out of white decal sheet and then slicing up some black cross decals to form the “T” – problem solved! I used the decals supplied from the Testors kit to finish both models, although the numbers for the II. /JG400 machine were pilfered from my yet to be built Dragon Me 163S-1 ‘Habicht’. This kit has supplied a decal sheet with a range of numbers that far outstrips those needed to build the model. I also purchased a set of crosses and swastikas from Aeromaster Decals in 1:48 scale and used some of the decals where I did not have sufficient in the kits in my possession. I enjoyed building this fantastic little aircraft and it is a great contribution to my expanding WWII collection of aircraft. 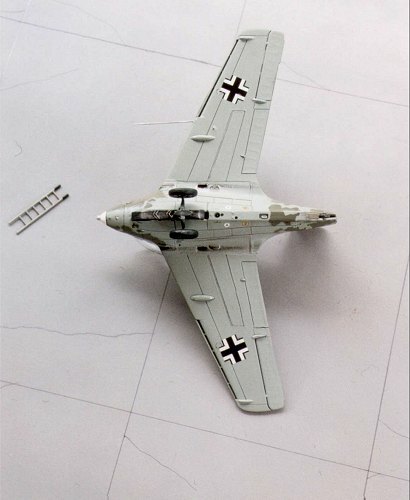 I still have the ‘Habicht” to build and, as a resin kit is now available for the HWK 109-509A Walter rocket in 1:48 scale I will definitely end up building another Komet. I would like to thank my local Hobby shop, Southside Hobby Centre, Buranda (south of the Brisbane CBD), run by Warrick and Bernie. Specifically Bernie Quigley, the “Komet Nutcase”, for his critique of Wolfgang Spate’s machine and the loan of a tremendous amount of reference material on this, the first rocket powered fighter aircraft the world has seen. 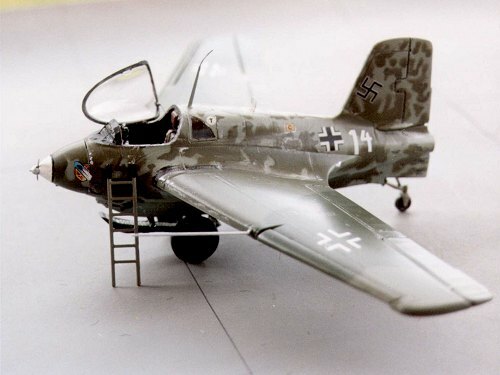 Bernie has scratch built the Me 163A as flown by Heini Dittmar on the first 1000+kph flight and presented it as a diorama.